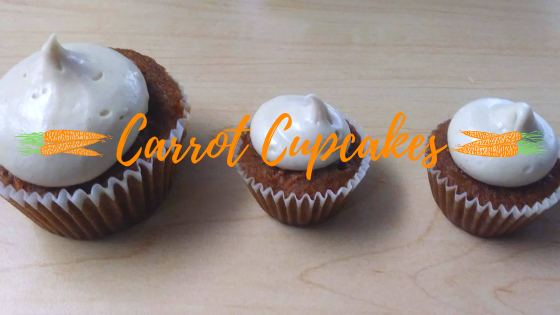 This is my carrot cupcake recipe. I usually double the below recipe as 12 cupcakes are just not enough to satisfy my coworkers (Especially when I sneak a few myself). Preheat oven to 350 degrees. Line your cupcake tin with liners and set aside. In a medium-sized bowl, whisk together the flour, baking soda, baking powder, salt, cinnamon, nutmeg, and ginger. Set aside. In a separate large mixing bowl, using a hand mixer or stand mixer) beat together the brown sugar, granulated sugar, and eggs until combined. Mix in applesauce and vanilla extract. With the mixer running on low speed, slowly pour in vegetable oil and mix until combined. Add the dry ingredients right on top of the wet ingredients and the shredded carrots right on top of that. Stir until just combined. Pour batter into the prepared muffin cups, filling each cup about 3/4 full. Bake in preheated oven about 18 – 22 minutes or until a toothpick when inserted into center of cupcake comes out clean. Beat together cream cheese, butter, and brown sugar till smooth. Let sit for 5-10 minutes till brown sugar dissolves completely. Add vanilla, salt, and enough powdered sugar to make a frosting thick enough to pipe.